Why do elderly Japanese want to go to prison? I read an interesting comment by Art Cashin that bears considering. Japan’s prison system is being driven to budgetary crisis by demographics, a welfare shortfall and a new, pernicious breed of villain: the recidivist retiree. And the silver-haired crooks, say academics, are desperate to be behind bars. Crime figures show that about 35 per cent of shoplifting offenses are committed by people over 60. Within that age bracket, 40 per cent of repeat offenders have committed the same crime more than six times. There is good reason, concludes a report, to suspect that the shoplifting crime wave in particular represents an attempt by those convicted to end up in prison — an institution that offers free food, accommodation and healthcare. The mathematics of recidivism are gloomily compelling for the would-be convict. Even with a frugal diet and dirt-cheap accommodation, a single Japanese retiree with minimal savings has living costs more than 25 per cent higher than the meagre basic state pension of Y780,000 ($6,900) a year, according to a study on the economics of elderly crime by Michael Newman of Tokyo-based research house Custom Products Research. Even the theft of a Y200 sandwich can earn a two-year prison sentence, say academics, at an Y8.4m cost to the state. The geriatric crime wave is accelerating, and analysts note that the Japanese prison system — newly expanded and at about 70 per cent occupancy — is being prepared for decades of increases. Between 1991 and 2013, the latest year for which the Ministry of Justice publishes figures, the number of elderly inmates in jail for repeating the same offense six times has climbed 460 per cent. If it weren’t so, so sad, it would be positively elegant. You are an elderly Japanese person who can’t get by. You are not aggressive so you want to commit a crime with no threat or hostility. So, you commit one of the most non-hostile crimes possible –shoplifting. When the authorities insist you leave and return to poverty, your simple recourse it to repeat the same crime, may even in the same store. Human adaptation is an absolute wonder to behold. Government planning, however, is prone to bring unintended consequences, usually of the worst order. People adapt to incentives and the results are not necessarily what was anticipated. It’s called the law of unintended consequences. As i read today’s story in the Wall Street Journal I was reminded of an old joke. It seems that machine politics in one city had gotten so corrupt that when thieves broke into the mayor’s safe all they found were the results of next year’s elections. We know that China has all the economic trappings of a capitalist society and the government of a communist dictatorship. Totalitarian governments that set production goals have ways of providing statistics that show those goals have been met. The question people are asking is whether those statistics are believable. Beijing appears to be on track, yet again, to hit its official growth target. According to China’s National Bureau of Statistics, gross domestic product rose 7.8% in the third quarter of 2013, well on its way toward hitting the official target of 7.5% GDP growth for the year. But can these numbers be trusted? Beijing has a long tradition of setting and then claiming to exceed high growth targets, which makes growth appear both rapid and stable. For years, China reported much less volatile economic growth than other developing nations, but lately volatility has all but disappeared. Since the start of 2012, China has reported a GDP growth rate within a few decimal points of the official target—every quarter. Another reason to question these numbers is that China’s second most powerful official has. In a 2007 cable revealed by WikiLeaks in late 2010, Chinese Premier Li Keqiang was quoted acknowledging that official GDP numbers are “man-made.” Mr. Li, who was head of the Communist Party in northeastern Liaoning province at the time, told then-U.S. Ambassador to China Clark Randt that he looked to more reliable numbers—on bank loans, rail cargo and electricity consumption—to get a fix on the actual growth rate. Some economists now call these economic indicators the “LKQ Index.” That index shows that China’s economic growth was a lot weaker than officially claimed in the first half of 2013 and picked up in the third quarter only on a new round of stimulus to meet the annual GDP target of 7.5%. Questions about China’s economy are not just of academic importance. China, with its huge population and it’s rapidly growing economy has a tremendous impact on the rest of the world. They are not just the producer of low-cost consumer goods but also the consumer of huge amounts of raw materials. China is the U.S. second largest trading partner. They are the world’s largest importer of oil and coal in the world. They not only export but also import hundreds of billions of dollars of electronic equipment. If the Chinese are not growing as rapidly as their statistics indicate, they may be creating a “bubble” economy which can explode like the housing bubble did in 2008 with a very dramatic economic impact felt throughout the world and with the potential for social instability inside China itself. Keep a very close eye on China. First, let’s define our terms: a “Bear Market” is defined as a market that declines more than 20% from a previous high. “All of a sudden, ka-boom, markets have deflated heavily,” said Matthew Sherwood, head of investment market research at Perpetual in Sydney, which manages around $25 billion. Over the past five weeks investors have been disappointed both by the Fed suggesting it may pull back on its bond-buying program and over Japanese Prime Minister Shinzo Abe’s long-term growth strategy, said Mr. Sherwood. The fear that the Fed could change its monetary policy, along with signs that the U.S. economy is recovering, has encouraged investors to pull money out of emerging markets that are typically perceived as risky. The resulting outflows have hit some of Asia’s smaller markets the hardest—such as the Philippines and Thailand, which were down 6.8% and 2.1% respectively Thursday. 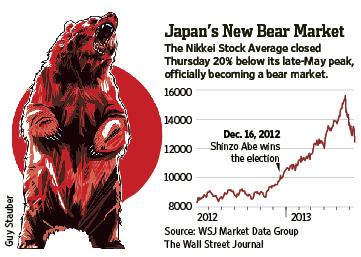 Along with Japan, these markets were previously some of the region’s best performers before the selloff started. It’s another good reason to re-allocate portfolios regularly since both rapid advances and sharp declines end and provide selling and buying opportunities.